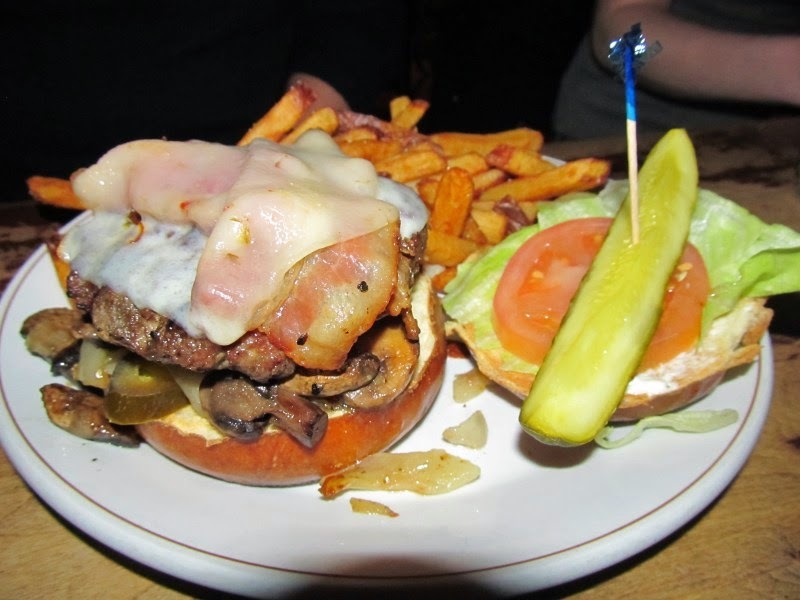 Burger Club are big fans of the King’s Head Pub at 120 King St, and when I heard about their March Special Burgers, I dropped what I was doing and booked us in. 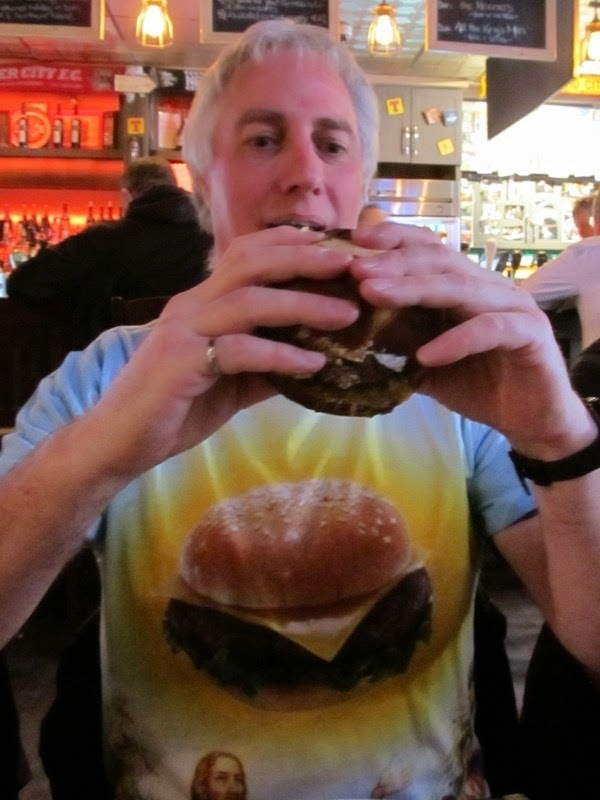 This was our fourth ‘official’ visit and it landed on the fourth anniversary of Burger Club. 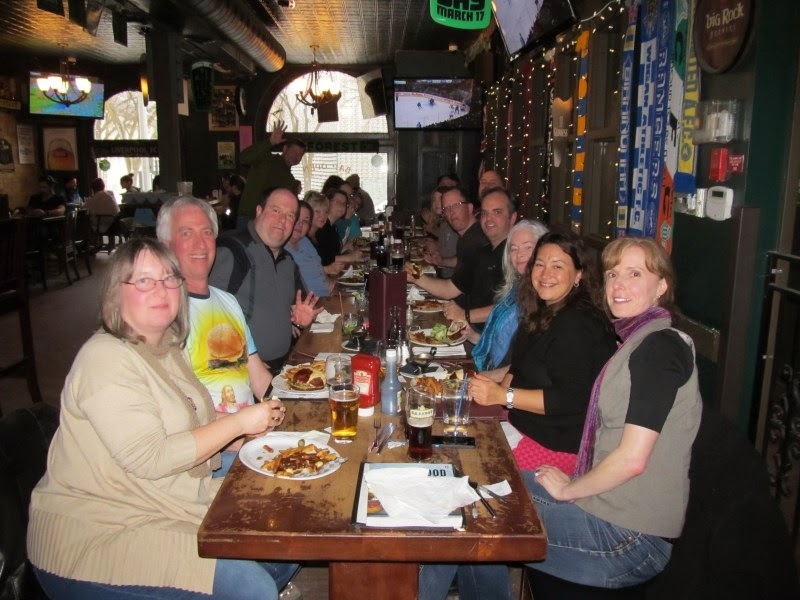 25 people made it out and staff had us set up at one long table on the bar side – they know how we like it! 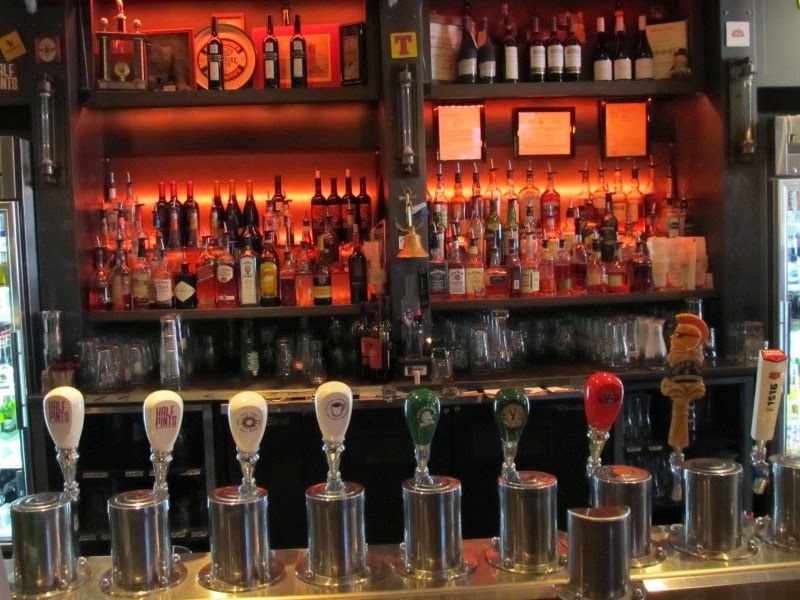 The King’s Head does service well and true to form, Kim did a fantastic job taking care of food and drink orders for our large group. Dave and Reg helped out and Chef Steve made a couple of burger deliveries himself to make sure we were all enjoying his and Jay’s creations. I don’t know how they do it, but the platters were coming out 5-10 minutes after people ordered. The new pretzel bagel bun was the hot topic and Jay Khanuja told us how they tested three different buns. They’re big, messy burgers and he knew the traditional Kaiser wasn't going to be up to the job. The first pretzel bagel they tried was too dense, but the pretzel bun they settled on was a soft bite and elastic enough to hold the whole assembly together to the last mouthful. King's Head hand forms the 7oz. beef patties using 15% fat chuck steak. The burgers are thick, firm and filling. The meat is tasty on its own and the mild seasoning leaves room for the flavourful toppings to make their own statement. No one left hungry and the platters are good value ranging from $10-$12. They put our burger handling to the test though, and even the training video didn't help unless you had gigantic hands and could do a pinky squeeze. Russ wrote “Oh happy day! 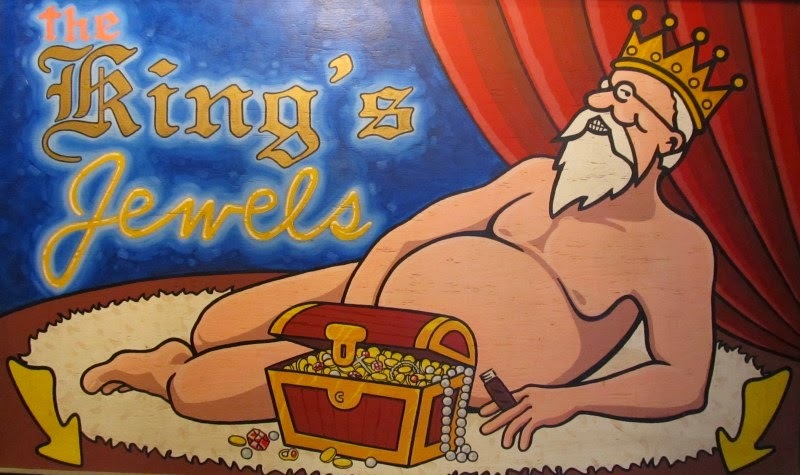 I highly recommend Winnipeg peeps head down to the King's Head before the end of the month. 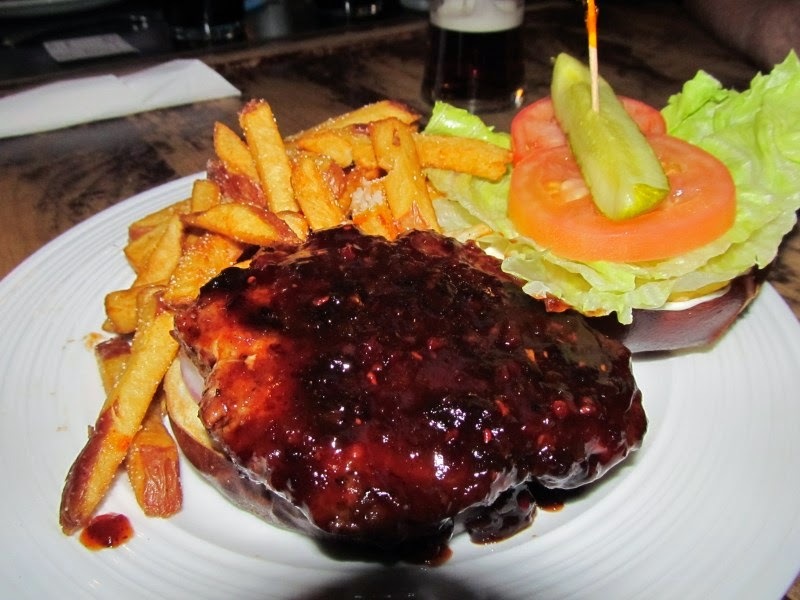 The 'Raspberry Jalapeño BBQ Burger' has perfect sweet heat and pairs great with a Guinness. 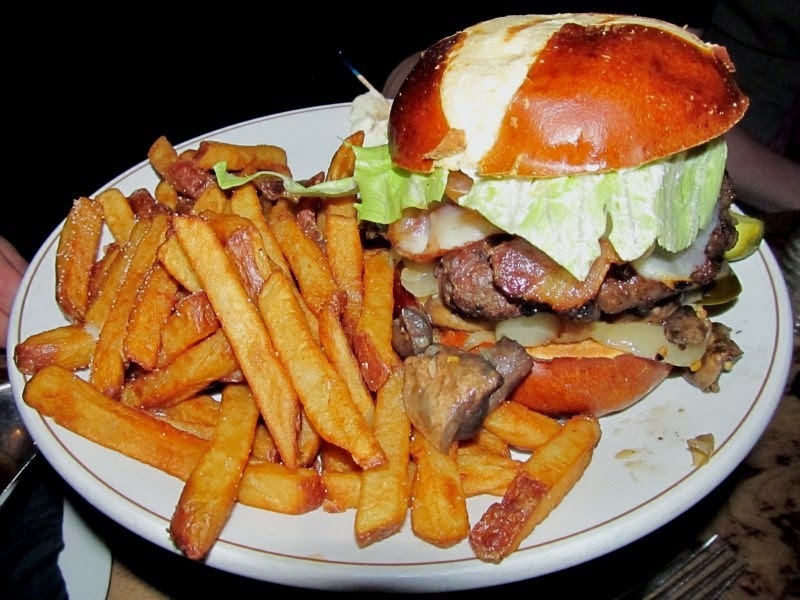 It makes your mouth warm before warming your belly.” Jacques said “I love the pretzel bun, they should keep it on the menu. I was impressed with the spicing; the patty was well formed and meaty.” Interestingly enough, this was supposed to be the ‘Chipotle and Jack Daniels BBQ Burger’ but the Chipotle peppers were off their prime so the kitchen made a quick change to use Jalapeños with raspberry sauce which ended up being the favourite. Blue cheese burgers are tricky to flavour balance because if there’s too much or too little, or the nose doesn't work, diners can be sad. 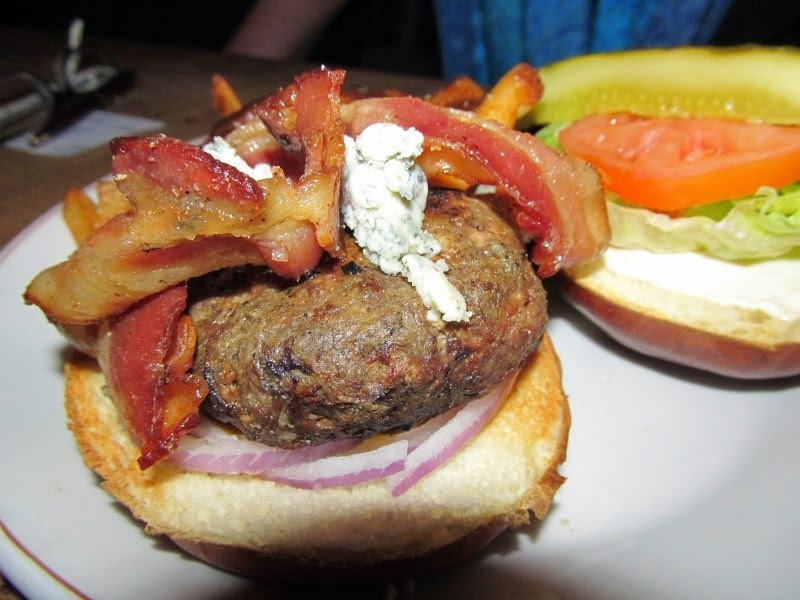 The King’s Head nailed it perfectly to make the ‘Stuffed Blue Cheese Bacon Burger’ the #2 March Special favourite. Scott wrote “I've been away too long, but it was like coming home. 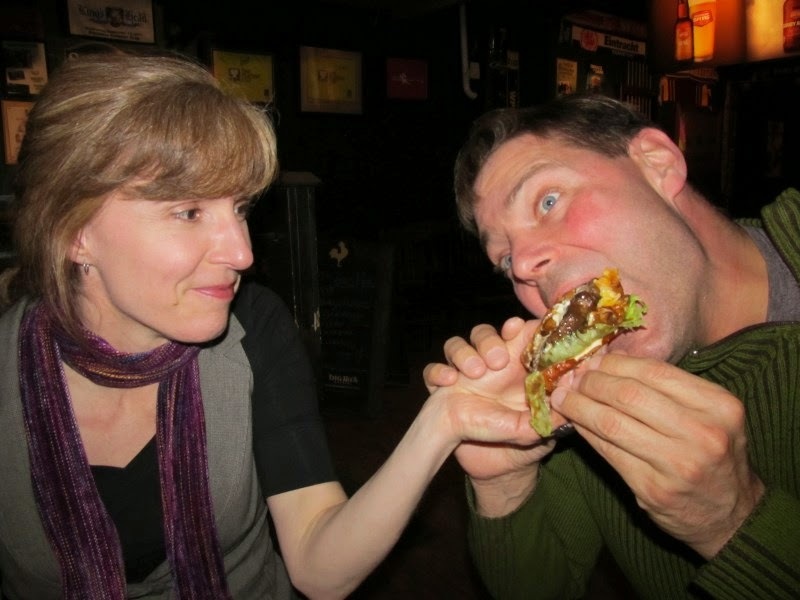 Good friends, good food.” Back in December 2012, Jay made us a blue cheese stuffed Khanuja with Cajun sauce and onion rings on top. It was a special creation and had we ranked it, it would be in our Top 5. 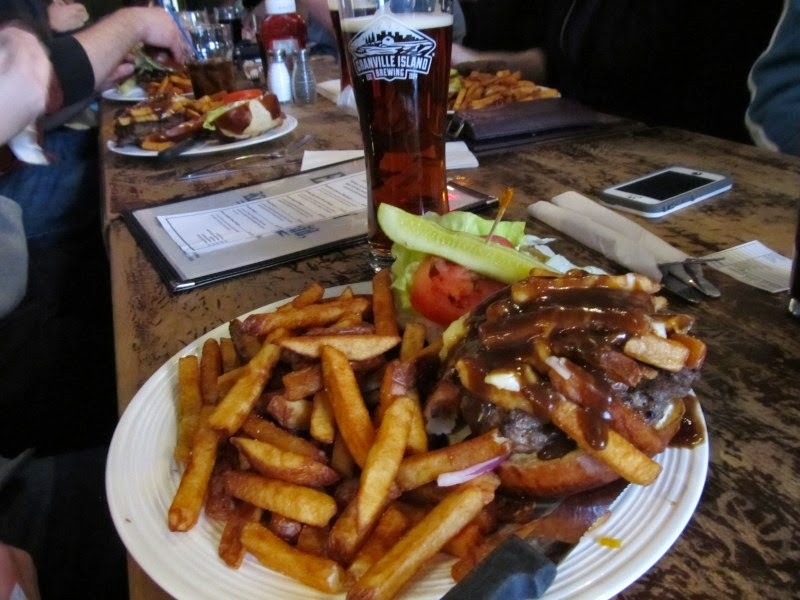 The fourth special beef burger was the ‘Poutine’ – also a popular selection and visually impressive. 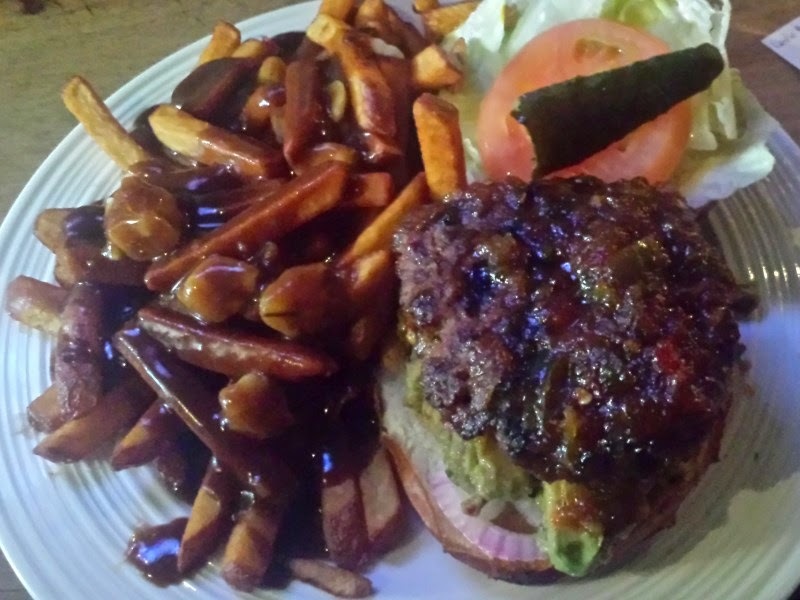 Geoff always gives me good words and had this to say “Since I've never seen anything like it before, I had to try the Poutine Burger. There was quite the heft to the creation, especially with the new pretzel bun. It was pretty tasty; the poutine meshed well with the beef. By the end, once it cooled the potato/cheese creation emulated another patty in consistency. Thankfully they don’t tell you how many calories it has!” Nat wrote “A slippery, tasty mess. 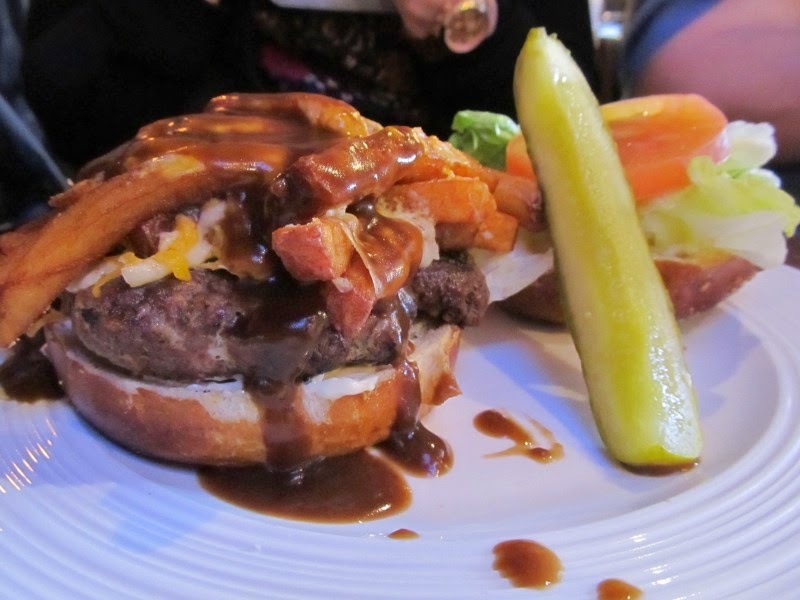 Did not hold together, but boy was it tasty!” Stephanie scribbled on her gravy stained review slip “I died and went to poutine burger heaven. Fun combination.” I should mention the gravy was another favourite – dark with plenty of garlic and roasted onion. I saw a couple of people drinking out of the gravy boat.